This week it is all about my three top areas to focus on for creating an enchanted life, free from struggle, stress and fatigue. Where ease and joy are the norm on any given day. In 2012 I stated a day spa and wellness retreat called enRich Retreat and Spa. Within 8 months of opening enrich went on to win the best day spa in Australasia award. Shortly after that my body said enough and I was diagnosed with stage two Adrenal Fatigue. I was literally burnt out, stressed out, maxed out and checked out. I decided to go on a sabbatical of wellness for the next 12 months. I resigned myself as managing director of my spa and became managing director of my life. My astrologist once said to me, Karina, you created an award winning business; can you create an award winning you? What transpired was a major transformation and led me to write my book, The StressLess Revolution. What I learned was if I focused on three key areas I could literally remove the blocks, which prevented life from flowing to me with effortless ease and grace. I could return my body back to homeostasis and ignite my intuition. And I could start to live my life without the push, push, striving energy, which just left me exhausted. These three key areas are your thoughts and beliefs, your food and your energy. When I addressed these three key areas my energy totally transformed. 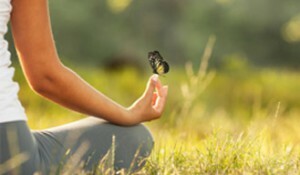 The beautiful Dr Wayne Dyer said that you are only one thought away from peace. It is finding that thought when we are in the middle of anger, frustration or suffering that is the miracle. A course in miracles says that we do not know how to deal with the situation serenely because of our thoughts about what happened. So the more we slow down and practice body presence on a daily basis the less we freak out over dramas, or issues in life. When I was diagnosed with stage two Adrenal Fatigue my body was so compromised from toxins that it was not able to absorb any of the good nutrients I was providing it. I had tummy fat which would not budge and I was probably five kilos heavier than what I wanted to be and no amount of exercise was helping. I thought I had a good diet at the time; I didn’t eat junk food or take away. But what I found out is that what we put into our body is one of the greatest influencers of our wellness. So after three years of research and being a human guinea pig I came up with the Alchemist Kitchen. It is a place where the food we eat does not stress our bodies; rather it nourishes and brings us back to homeostasis or that perfect balance. When I adopted this way of eating I shed five kilos effortlessly and lost that muffin top. For me, how I start the day determines how my day unfolds. I have a morning ritual, which sets me up for a drama-less day. If things go haywire I don’t react, I can respond with wisdom and from a place of peace. It includes chakra clearing, meditation, superhero smoothies and restorative movement. I learnt so much information in regards to going slower than I’ve ever gone, in order to go deeper than I’ve ever been so that I can shine brighter than I’ve ever shone. I wanted to be able to share everything I had learned in a way that was relevant, attainable and affordable and that was when I hit on the idea of taking my retreat and putting in online. I created a virtual sacred cyber space, filled with videos, audio’s, meditations, and guided visualisation, yoga and so much more. This space acts exactly as any physical retreat, only it is online and you have access to it 24/7. You don’t have to leave home and you don’t have to pay thousands of dollars to get access to it. If life is busy, hectic, drama filled. If life is a struggle, a strain, if you go to bed exhausted and long for a holiday to escape then you have to sign up to enRich Virtual Retreat. If you do one thing for yourself this year then sign up to the retreat. You get 12 months access; each month there is a new theme and new content. You get to access to all the previous months videos and resources. There is so much going on behind those cyber doors you really have to experience it for yourself. Click here to read all about our virtual retreat, oh and if you have any friends that you would love to share the experience with send them over to enrichretreat.com as well, the more the merrier.